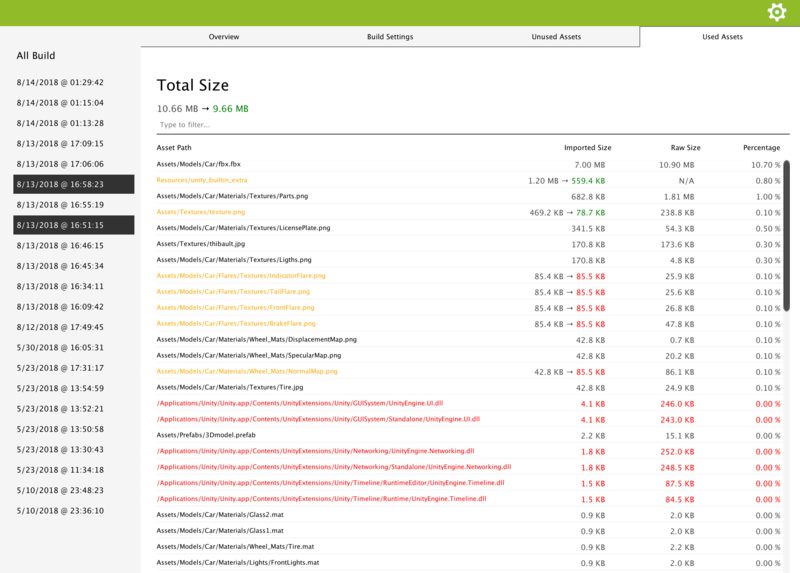 This panel will show you detailed information about which assets were removed, added, or had size change. Assets can be filtered exactly the same way as when you display the information of one build. See Used/Unused Assets for more details. When you order assets by imported size or raw size (by clicking on the column header), assets will be ordered based on the size change that occurs. If an asset changed from 4 Mo to 7 Mo and another one from 10 Mo to 8 Mo, the latest will be considered smaller than the former one since it decreased the size of the build by 2 Mo, whereas the former one increased it by 3 Mo. You can display a combination of Added/Removed/Modified/Unmodified assets by entering in the filtering bar : state:[combination of 'a', 'r', 'm', 'u']. state:ar will only show you added and removed files. state:m will only show you modified files. You can combine this filtering with any other filtering explained in Used/Unused Assets. For example, state:ar t:plugin will show you all the removed and added .dll/.so/… in your build. state:a t:texture car will show you all the textures with car in their path and that are newly added to the build.